Introduction: We use a considerable amount of water passing through ion exchangers for production of medicine. In water directed for usage, apart from chemical parameters, a number of bacteria contained in it is very important. Quality requirements demand to maintain the [bacteria] colony amount below 1000. Through the trial, we have come to a conclusion that the mentioned amount can be maintained only if we rinse the pipes after ion exchangers two times weekly with a sub-chloride solution, as well as if we limit the work of ion exchangers to 72 hours (successive regeneration of ion columns also annihilates bacteria). During rinsing the work of those columns is stopped for 1.5-2 hours, whereas such a downtime creates production problems. Due to complicated character of the system after the third trial, we succeeded to find it. The advantage of this device is without a doubt that it can be installed without the necessity to modify the installation, only through snapping to the outside of the pipe. Before the installation and subsequently after it, we carefully measured daily the amount of growth of bacteria colony. The results confirmed expectations – there was the reduction by 80-90% of bacteria colonies. MAGNETIZER® is far more beneficial than the traditional methods of softening water as they are chemical based, salt or power using, whereas MAGNETIZER® is an ecologically sustainable, monopolar, natural, healthy and organic method of softening water. Comparative differences between the traditional chemical, ionic exchange/salt based and RO water softening methods vs. the Magnetizer’s ecologically sustainable, natural, magnetic, mono-polar way are presented in the table below. *Magnetizer® tests have shown 90% reduction of SAR (Sodium Adsorption Ratio) in saline water (click). Magnetizer® “RWE-S” efficacy is calculated in accordance with the size of a house and the hardness present in water. A bigger house with extremely hard water conditions requires the installation of extra units mounted at a distance of 1 inch from each other. If a home is < 2,500 sq. ft. (>230 m2) then 1 unit of RWE-S is required. This means that there are two rings required for cold water inlet and hot water outlet of heater/boiler. If a home is around 2,500-5,000 sq. ft. (230-460 m2) then there is the requirement of 1 unit of RWE-S + 1 unit of RWE-1. It requires a total of three rings in which 2 rings are placed 1 inch apart on cold water inlet and one on the hot water outlet of the heater or boiler. If a home is > 5,000 sq. ft. (>460 m2) then 2 units of RWE-S are required. This means a total of four rings: two rings placed 1 inch apart on the cold water inlet and two rings placed 1 inch apart on the hot water outlet. If your home is located in a hard water area which has >10 grains ppm then you require double RWE quantity to attain the effective outcomes. Stabilization is the procedure of eradicating all the deposits and lime-scale from inside of your water pipes, appliances, and other fixtures. 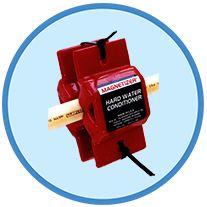 When Magnetizer® “RWE-S” water conditioner is installed in your home, then it is a must to open all your taps whether hot or cold in showers, bathtubs, sinks or toilets for around 10-15 minutes once in a week for three weeks. Your stabilization period will be accelerated by this flushing procedure and you will get lifetime advantages of having naturally conditioned soft water that will be permanent. In addition, your water heater needs to be flushed by opening the valve at the bottom to allow the water to run until it’s clear. This is required to be done at an interval of two to three weeks until the water running out is completely clear. In case your water heater is less than a year old then flushing is not necessary. You can contact your local plumber about any queries regarding flushing of water. Stabilization Period enables you to enjoy the lifetime benefits of permanent, naturally conditioned, softer water quicker. During the flushing cycle, some sediment may be deposited in the bathtub. It may vary from every place, from instant one which is five to ten minutes after the “RWE-S” placement to two weeks which can even extend to thirty days. In industries, stabilization can take up to three months. The answers provided in this section may help in your decision making process. 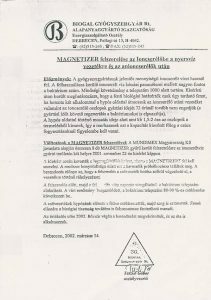 Our intention has been to raise your awareness about Magnetizer. If a time comes that you decide to make this one time investment, Magnetizer will start immediately working for you 24/7 for the lifetime of your property, equipment or vehicle. WE ALREADY HAVE A WATER SOFTENER. CAN MAGNETIZER HELP? Definitely, the Magnetizer® will help as the surface tension of water is reduced and when something will be added to the magnetized fluid, it will mix and dissolve more promptly. If you already have a water softener installed the magnetized water enhances the efficiency of this softener by augmenting the net ion charge and therefore a better chemical reaction takes place in the normal exchange of ions. With the increase in efficiency, your water softening system will require less salt with Magnetizer® as it is known to reduce the consumption of salt by more than 50 percent. However, the softener is not essential with Magnetizer® as one of our distributors got softeners removed in Hotel’s coffee machines by Magnetizer® “RWE-S” system. With this change, the customers complimented the management about how they served the best coffee in town. Kindly scroll down for Water Test Data here for additional information. Magnetizer system was attached to a breaker that contained magnesium and calcium in water solutions. It was determined by the authorities at ASTB labs that the ion X-changer and filter removed around 90 percent of magnesium and calcium. The Magnetizer unit provided 99 percent removal efficiency of the magnesium and calcium dissolved in water. HOW CAN MAGNETIZER HELP THE REVERSE OSMOSIS SYSTEM, WE HAVE ONE IN OUR HOME? Reverse Osmosis system or the RO is a system that provides ultra-filtration, which is why the water with high mineral content clogs the membrane with crystals of mineral. However, magnetized water prevents the formation of crystals so placing Magnetizer® system on the feed of the Reverse Osmosis unit will prevent the clogging of the filtration membrane and this will eventually reduce the time wasted in flushing the clogged membrane of the filter. Additionally, advantages of treating water with Magnetizer® are dual as it reduces carbonate pore structure buildup and reduces the number of water clusters present in a non-chemical group of water molecules. With the reduction in the number of water molecules in the cluster is a considerable reduction in surface tension of water from 71 dynes per sq. cm. to 62 dynes per sq. cm. With a reduction in the surface tension of water, less effort required is required to thrust the water molecule through the membrane of filter leading to energy efficiency. 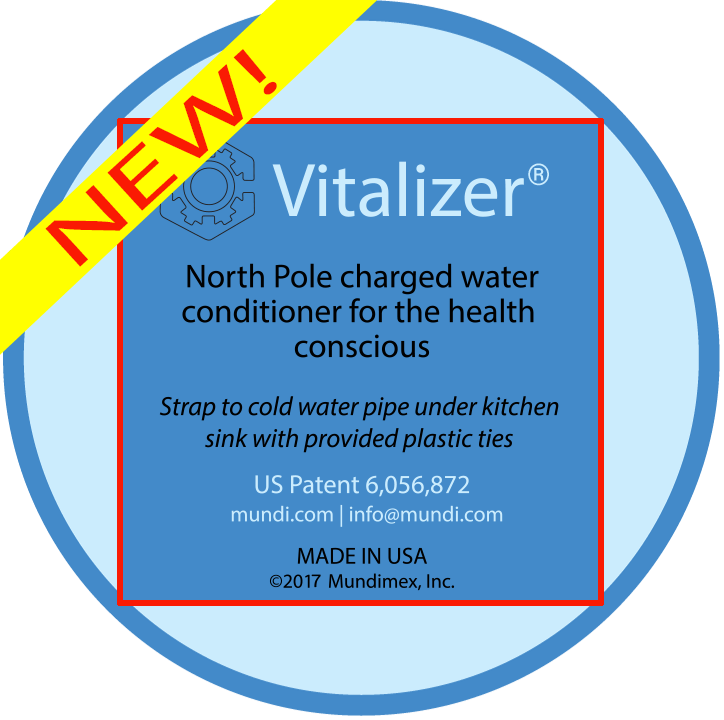 Mundistore has a Magnetizer® “TUBS” system that has been bought by thousands of homes in the United States who purchase water purification tanks ranging from $2 to $3K like filtration steel tank systems, decontamination tanks, RO filter tanks, etc. Magnetizer TUBES are a vital companion to your filters that treat water naturally in a chemically free manner and condition it to protect your expensive filtration units by fighting against lime-scale, metal pitting, corrosion and bacteria. Magnetizer reduces the surface tension of water and makes hard water behave like soft one. With its usage, you will get cleaner laundry, dishes, cars, etc. With the reduced surface tension you will get a better effect in rinsing that reduces spotting on drying. This patented hard softener restricts lime-scale deposits and corrosion by magnetic treatment and hard minerals are suspended in water throughout the water lines of your home. The conditioned and magnetized water is safe and healthier for plants, lawns, and gardens as it enhances their growth with additional minerals reduce usage of fertilizers and conserve water. Molecules in water are chaotic, randomly and naturally placed along with minerals that form scaling. When these molecules enter the magnetic field they are placed haphazardly, but when they pass through the field, they get charged and realigned. This field is greater in charge as compared to that of minerals and plumbing which reduces the surface tension and creates a soft water effect. Magnetizer® causes a unique and patented non-linear polarization which affects the water instantly unlike other magnetic systems. This is the key constituent of our success with proven outcomes. WHAT MAKES MAGNETIZER SYSTEM UNIQUE? 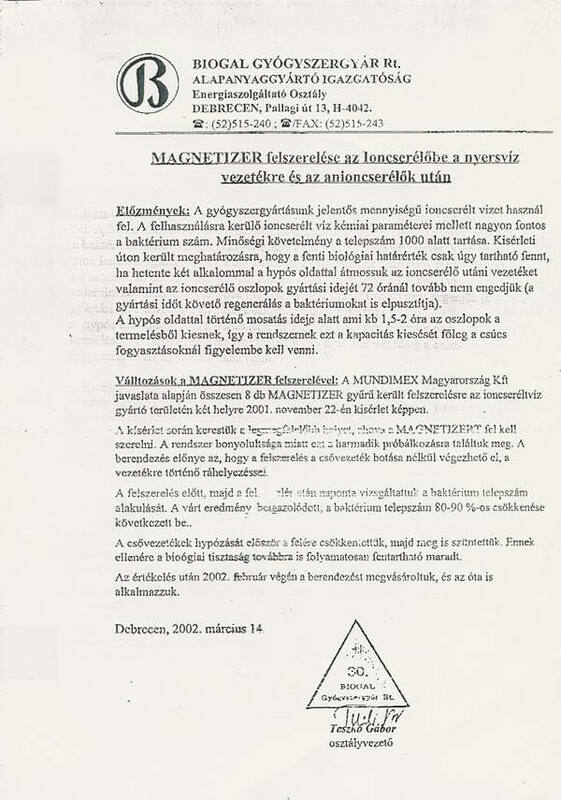 Magnetizer® system is unique because it uses a monopolar technique, which is patented and guarantees best results while the strength of the magnets is subordinate (click here for visual confirmation). It consists of the best ceramic alloy magnetic piles that have been fabricated originally by NASA and has a unique design that is formulated to center all the magnetic energy on the pipes and the fluid. Some basic principles are vital in creating the efficacious design and solicitation of the magnetic treatment of water. 1. Uniform Exit Pole Imprinting due to monopolar treatment. 2. The configuration of magnets yielding required strength of the magnetic field (flux power). 3. Properly focused energy field and the right polarity. 4. Larger Surface Contact Zone (Contact Time) of the applied magnetic field when compared with other bi-polar magnetic systems. 5. The ideal location system placement—the installation know-how—to account for turbulence, the distance of travel, pipe composition, flow rate, mineral composition, temperature, etc. HOW CAN YOU TELL MAGNETIZER IS WORKING? Algae that traditionally builds in hot water tank and back of the toilet is eliminated. Even fish tanks will stay cleaner longer (make sure your water is filtered if using for a fish tank). DOES IT WORK ON ANY TYPE OF PIPE? It works on most PVC or PEX pipes and copper. It does not work out of the box on braided stainless steel/galvanized steel pipes. There is a special setup needed, which needs to be applied. Call for details. This product is an investment which lasts a lifetime. You will enjoy its power and service for many, many years as there will be no need for replacement and hence you save a lot. WHAT IS THE RECOMMENDED “STABILIZATION PERIOD”? Stabilization is the process of removing all the existing scale from inside of water pipes, fixtures, and appliances. It is required that after installing the Magnetizer® home “RWE” System, you open all your taps (hot & cold) at all sinks, showers, and bathtubs while flushing the toilets for a period of 10-15 minutes once a week for the first three weeks. This flushing technique will accelerate the Stabilization Period enabling you to enjoy the lifetime benefits of permanent, naturally conditioned, softer water quicker. During the flushing cycle, some sediment may be deposited in the bathtub. Stabilization Period in homes may vary, from immediate (5-10 minutes after opening taps upon Magnetizer® installation) to two weeks and even thirty days. In industrial applications, this can take up to three months. 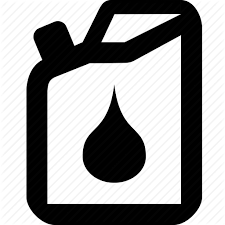 In the engine fuel-air-coolant treatment by Magnetizer® the Stabilization Period is the amount of time it takes to dissolve the carbon/varnish build-up and magnetically saturate all the steel parts between fuel units and the combustion chamber. It is factory recommended time allowed to saturate metal parts magnetically, clean the internal parts of carbon varnish, allowing the engine to show greater than normal amplitude of savings. The economy may initially fluctuate as the carbon and varnish are naturally eliminated during the Stabilization Period. After stabilization, the engine will run smoother and start easier. The Stabilization Period lasts approximately 30 days or 1,600 miles. The economy/performance will increase over that period resulting in higher efficiency. In gasoline engines, the Magnetizer® Engine Fuel Saving Systems provide engines with “HIGH-TEST” performance while using Lower Octane Gas, thereby creating even greater savings. The USP of this product is that it does not require any maintenance. It contains ceramic permanent magnets originally engineered by NASA, that do not lose their power or degrade with time. Hence, we give you a lifetime guarantee of this product and if there arises any need for replacement, we should replace them for free if they lose power in normal working conditions. IS MAGNETIZER DIFFICULT TO INSTALL? Magnetizer® is an easy-peasy process. It requires no tools and can be as easy as tying a shoelace. Also, the best part about it is, it is portable. Softening mainly refers to replacing the most essential minerals in the water with sodium (which doctors warn can be harmful to health), replacing those minerals by using special filters. These two methods can be problematic as they cause pollution, health risks and most importantly wastage of water. Magnetizer has its own distinct and non-chemical way of softening water. With the reduced surface tension of water after magnetization (same metric you will find with chemical softeners), Magnetizer® creates soft water behavior. The difference between soft water and hard water is crystallization, which causes scaling in hard water. 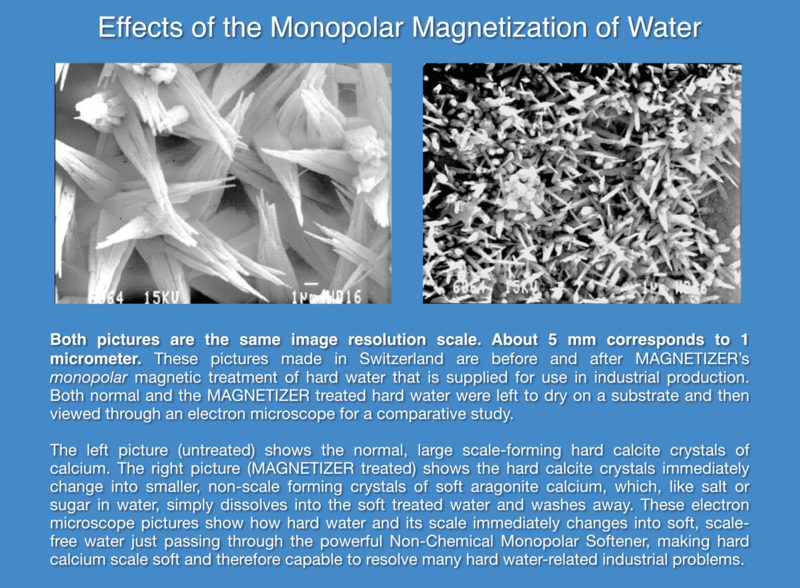 When Magnetizer is used to convert the water, the nucleating effect of scaling (crystallization) is reversed. This leads to lower surface tension (a characteristic of chemically soft water), as well as that of Magnetizer®. Magnetizer softens water (shows lowered dynes per sq. inch), just like its chemical counterparts. See more on this subject here. WILL IT REMOVE MINERALS FROM THE WATER? There are no minerals removed while using Magnetizer which is what makes it healthy for people, plants, and animals. By keeping the minerals in the solution, the magnetic scale control systems will not let the minerals accumulate in plumbing systems and at heat change locations. Limescale develops when the minerals in hard water precipitate out of solution as the water is heated and form hard crystals called Calcite. When water is passed through a properly designed and applied magnetic field, the physical nature of water and calcium molecules change, to form less dense crystals called Aragonite. Since this carbonate mineral is very light, it remains suspended in the water flow until it passes out of the plumbing system. This prevents new scale formation and removes the existing scale over time. In closed systems (industrial boilers) the Aragonite slush descaled by Magnetizer® has to be physically removed from the equipment. WILL MAGNETIZER AFFECT PH OF A FLUID? Magnetizer affects the PH of a fluid in the way you want it to, which means it stabilizes the PH. Magnetic influence result in making fluids configured and ionized such that the H+ and OH- ions move towards parity forcibly. This happens as they are placed in close physical proximity to other molecules that are able to accept these ions into their structures. Neutralization process is what it works on. Converting the acidic fluid into alkaline and alkaline into acidic by accelerating the general iconic content, is what is termed as neutralization. Additionally, this unique ionic activity buffers the pH, actually reducing the wide variations found in fluids. Yes. And this happens in two distinct ways. 1. Magnetic influence neutralizes and buffers the liquid. 2. Dissimilar metals create electrical charges that alter equipment surfaces. Magnetizer® water softener eliminates scale formation and hence any scale-related electrolytic corrosion. This type of corrosion is caused by the adherence and subsequent electrochemical reaction, of scale to a surface. To alter the structure of the scale forming minerals, these magnets magnetize any liquid which flows past them disrupting their natural bond. This disruption leads to an alteration in the structure. The contaminants (such as calcium carbonate) remain suspended in water until it flows out through your plumbing system, hence reducing corrosion. CAN MAGNETIZER SYSTEMS HAVE A BENEFICIAL EFFECT ON PROCESS FLUIDS THAT ARE PRESENTLY CONDITIONED WITH CHEMICAL ADDITIVES? With Magnetizer process fluids mix more readily with conditioners because of their low surface tension. They tend to exhibit more wet behavior and this uniform bonding improves the mixture. This utilizes chemicals more effectively. Briefly, the magnetic influence increases the fluid’s affinity for the conditioner – reducing the conditioner’s normal precipitation from the fluid and, as a result, the same conditioner works longer and as a result is less expensive. CAN ANYTHING ADVERSELY AFFECT MAGNETIZED FLUID? A negative impact on magnetized fluid can be caused if there is a strong physical disturbance. As the molecules are tied into a rigid configuration forcibly by the magnets if a pump impeller causes any turbulence, the water meter or the disturbance will make the magnetized fluid lose its orientation and qualities. This is what is known as vibrational depolarization. For this reason, we always install our systems after such disturbances; for example, after the water meter on a straight piece of pipe, and on the hot water tank outlet pipe after any elbows. Sometimes we recommend increasing the magnetic boost using additional units mounted side by side. Similarly, magnetized fluids that lie dormant for a long period of time will eventually lose their induced orientation. Water treated by Magnetizer® retains its magnetized state through up to 200 feet of pipe, depending on pipe OD and the systems used. 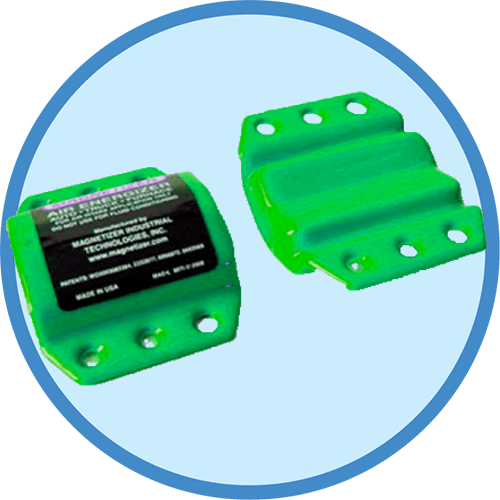 The magnetic effect lasts for up to 48 hours in stored water treated by Magnetizer® magnets. 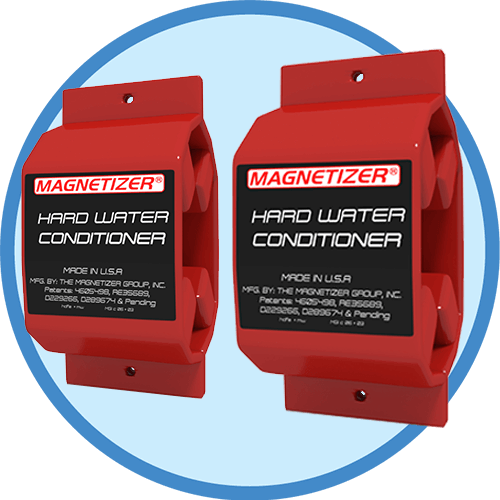 Since most households use their water system regularly, they can be assured of a constant supply of properly conditioned water treated with Magnetizer® magnets. DOES HEAT AFFECT A MAGNETIZED FLUID? A magnetized fluid is not affected by heat but interestingly by the process of heating. 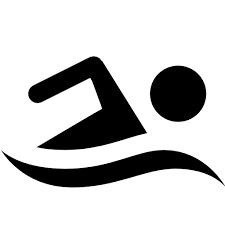 Currents during the process and physical movements of fluids such as water coming to a boil cause disorientation to the desired magnetic effect. This is the main reason why our systems are installed on the outlet pipe from the water heater and not inlet pipe. HOW MAGNETIZER COMPARE TO ELECTROMAGNETS? Magnetizer® has been scientifically designed to use its strong, focused, unipolar field to penetrate any pipe, PVC / glass included, and not perpendicular to it, on its surface, like electromagnets work with PVC or glass. In general, plastic does not conduct electricity. It has no free electrons. All the electrons are tightly bound to the atoms. That’s why plastic is inert. Although there are conductive plastics (special polymers), PVC is not one of them, and even if it conducts electricity it does it not nearly as well as copper. PVC has the addition of plasticizers, of which most widely used being phthalates. In this form, it is not conductive and is used for example for insulation on wires, electrical cables, etc. Also plastic has potential to collect the static charge on its surface (a possible hazardous situation). So not only PVC does not conduct electricity, but all the electromagnetic charge travels over the surface, not through the body of the plastic pipe. That’s why at water technology show in Marseille, France (“Hydrotop”) our distributor has made side-to-side comparisons and electromagnets did not work both on plastic (PVC) and glass pipes, whereas Magnetizer® was performing very well. For more information please click here. IS THERE ANY SCIENCE BEHIND THE MAGNETIZER? The roots behind the Magnetizer go way back almost as much as 120 years ago when Michael Faraday (click here) discovered that weak charge is generated even when water flows past a conductive material. This study of dynamics of electrically conducting fluids is called Magneto-hydrodynamics (MHD). MHD is a physical water treatment using advanced magnetic technology for neutralizing the lime scale caused by Calcium Carbonate in hard water. This theory is the basis that we use today when treating water and other fluids with magnetism. Magnetizer has this science behind it and this is the principle on which it works. More explanation and complexities of MHD can be explored on Wikipedia.